Today, outdoor entertainment means much more than barbecue grills and patio furniture. On average, Orange County residents are spoiled with more than 280 days of sunshine a year, which is why these outdoor spaces have taken on the name “California Rooms”. California rooms have become an extension of our homes, and most include outdoor kitchens for entertaining. Custom outdoor kitchens can include pizza ovens, wet bars, refrigerators, cook top burners, smokers, and warming drawers. Remodeling and designing your outdoor kitchen can be a dream come true. Not only does it add value to your home, but if you like to have people over and enjoy entertaining, odds are you will be using your outdoor kitchen for more than just the occasional barbeque. 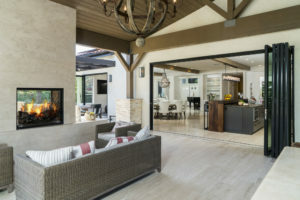 Your outdoor California room can include anything you can dream up – large family dining tables, comfy couches in front of a built-in fireplace, televisions, bars, you name it. The days of running back and forth from the backyard to the kitchen are over. You can now eat and relax with guests, all while enjoying our great weather. While one can dream of their perfect outdoor entertaining area, it may be harder to put together a cohesive design and plan than you think. Work with a designer to discuss your kitchen remodel and your vision, and let them handle the design, structural plans, material details and execution. Two design elements that are paramount to client satisfaction, is having enough counter space in order to prep and serve food, as well as making sure that you have functional storage to avoid the trip back to the kitchen indoors. Make sure your design does not isolate the cook from the rest of the party; there is nothing worse than getting stuck with grill duty while hearing everyone else having a blast! Lastly, choosing the right furniture and layout for your outdoor space will keep your guests entertained, and your soiree running smoothly, so you can thoroughly enjoy the festivities, too. Happy planning!